Indiana Pacers coach Frank Vogel walked back from comments he made about the Miami Heat over the weekend, telling local radio that the current version of the Heat is better than the team that won the NBA Finals last June. "They're better this year than last year," Vogel said of the Heat to 790 The Ticket Monday. "They're not just another team." Vogel referred to the Heat as "just the next team that's in our way" on Sunday, but was misquoted by reporters who told LeBron James that he called the Heat "just another team." James reacted quite strongly, telling reporters the Heat are a "great team," adding, "We're very confident. We'll be ready for them." Vogel pushed back against the notion that the Pacers are taking Miami lightly. "We have a great deal of respect for them," he said. "It was a quote taken out of context." James seemed more calm about the situation on Monday, telling the Miami Herald, "We have respect for them as well. It's two really good teams." The Pacers and Heat squared off three times during the regular season, with Indiana winning the first two meetings (in Indianapolis) before the Heat won a March home date by 14 points. The two teams met in the 2012 Eastern Conference semifinals, with Indiana taking a 2-1 series lead before the Heat closed out with three straight wins to advance to the Eastern Conference Finals. Last season, Vogel drew the ire of the Heat by accusing the Heat of excessive flopping (an accusation which drew him a $35,000 fine from the NBA). Vogel did not shy away from expressing confidence in his team on Monday, though. "We're definitely confident," he told WQAM. "We've got a good basketball team." 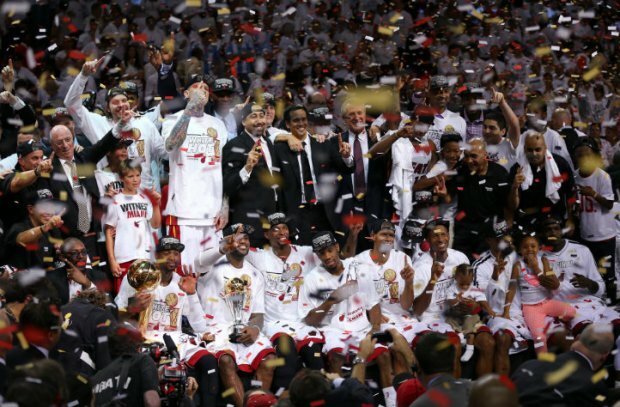 The Eastern Conference Finals tips off Wednesday night at the AmericanAirlines Arena in Miami.